can add onion for more quantity.If oil is coated till top on the kadai before making curry.it will not stick to kadai and comes well. 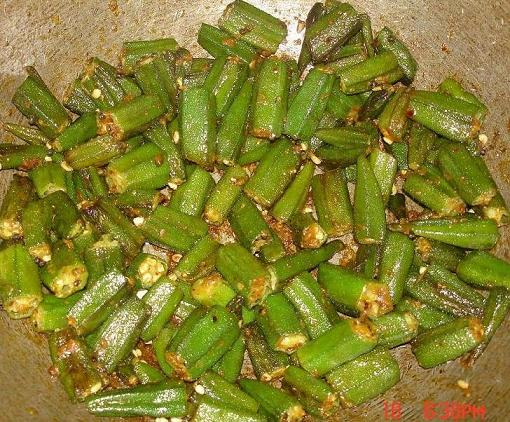 Wash and Strain the water and dry the okra for sometime.Remove only the head part and cut it of 1 inch. Dry roast urad dal,chana dal,jeera,red chilli,coriander seeds and grind it into a coarse powder. Heat the oil in a pan and after mustard breaks,add okra and sugar.saute for 4-5 minutes. Then add the dry grinded powder and cook for another 2 minutes. Add garam masala & salt at the end.Mix well. note:please do not over cook.sugar is added as the color is retained.